There’s a new record for the most distant galaxy, or the youngest galaxy depending on your point of view. Either way, it is the galaxy with the highest redshift. 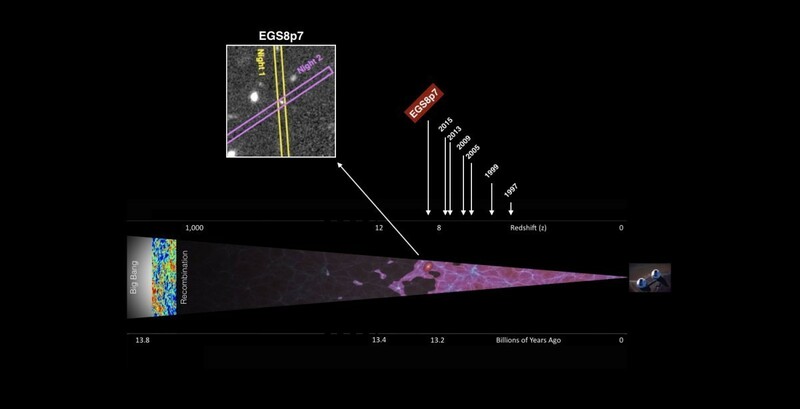 The previous record was a galaxy known as EGS-zs8-1 with a redshift of z = 7.73. This new galaxy, EGSY8p7, has a redshift of 8.68. While greater redshift does mean greater distance according to Hubble’s law, determining what that distance is depends on what you mean by distance. The light from this galaxy has traveled for nearly 13.2 billion years, and so it comes from a time when the universe was only 600 million years old. Because of the expansion of the universe over that time, the galaxy is now more than 30 billion light years away. While breaking the distance record is what tends to make headlines, the extreme youth of this galaxy is more interesting astronomically. What’s particularly interesting is the fact that we can observe a hydrogen emission line known as Lyman alpha. This is unexpected, since we would expect there to be lots of diffuse hydrogen clouds during that early period of the universe, and those would tend to absorb the Lyman alpha line. The fact that we can observe the line in this galaxy means that either there were less clouds around than expect, or this particular galaxy was particularly bright. This could be the result of strong star production in the galaxy. It is claimed that in 2012 Hubble found a galaxy with redshift z = 11.9. Was this later retracted? How do you maesure the speed of galaxy expantion? Why is this described as the “youngest” known galaxy? Young in common parlance means more recently born. So wouldn’t in fact be the oldest galaxy? It’s because what we are seeing is a galaxy when is was young. Since light takes time to travel, the most distant galaxies we observe are also from a time when the Universe was very young.